Quality and comfort combined with a simple compact fold system. At the top of the Jané range is the Rider and its 3 wheel all-terrain version, the Trider. Its anodised aluminium tubular chassis is fitted with an ingenious and innovative patented folding system ensuring that when the chassis folds, the unique retractable rear wheels reduce the folded size by an extra 30%. This makes it one of the most compact on the market. The lightness of the aluminium along with the balanced geometry and the large diameter rear wheels, make it quick, comfortable and easy to push, while the magnificent rear suspension with adjustable shock absorber makes the ride very comfortable for your baby. The streamlined chassis has a unique inverted ‘C’ shaped structure making it easier to push and, because there’s no obstructive rear axle for feet to kick against, your posture isn’t compromised, offering you a light, easy stroll. The higher seating position means the Rider can also be used as a highchair when out and about as it adapts perfectly to table level. Its seat unit is also reversible meaning it can be fitted onto the chassis in two different directions, with baby facing you or facing ahead. This travel system package comes complete with MICRO foldable carrycot – practical and light with a quick unfolding system, and the latest version of the award winning KOOS i-Size infant car seat - the new iSize car seat with dual installation: isofix or seat belt. Large deep seat unit with extendable hood. Complete with the MICRO - a foldable carrycot – practical and light with a quick unfolding system. Complete with the KOOS iSize infant car seat - the new iSize car seat with dual installation: isofix or seat belt. Large puncture proof PU wheels which are 10 times harder wearing & ball bearings for maximum freedom of movement. Higher seating position means it can be used as a highchair when out and about. Extendable 50 UPF Hood with raincover. Adjustable suspension with central shock absorber optimises baby’s comfort. 80-113 cm hardwearing leatherette ergonomic handlebar. Patented folding action that reduces the folded size an extra 30%. Easily unfolds with just one hand. Detachable and reversible seat unit allows baby to faces either direction. Handle bar brake lever, so there’s no foot-operated brake pedal to threaten your good shoes or the toenails of sandal wearers. Wheels have steel ball bearings to maximize manoeuvrability and new with highly resistant and shock absorbing PU tyres that are 10 time more hard-wearing than traditional tyres. 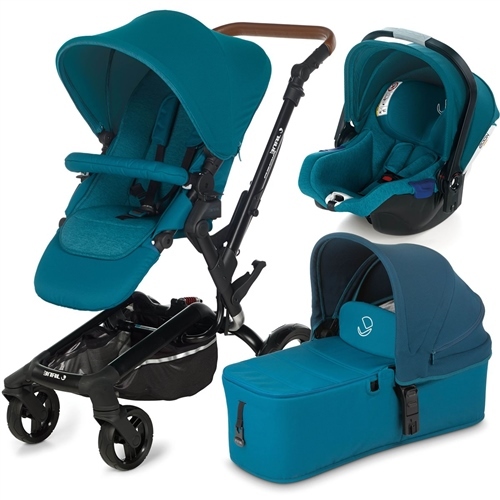 Adjustable suspension with central shock absorber, this absorbs the shocks to baby produced by rough road surfaces, improving your baby’s comfort. Higher seat unit keeps baby above the pollution (ie.car fumes in the city) and to be used as a highchair when out and about. Quick release removable rear wheels for compactness. Height adjustable, soft touch handlebar (80 - 113 cm). Extendable Maximum Protection Hood with visor: protection against UV radiation 50 UPF, water repellent and wind proof. Raincover included..
Aluminium structure delivers stylish modern design and practical lightweight functionality. The rigid one-piece base lets the baby rest in complete comfort. The Micro Soft carrycot includes an extendable hood and removable apron. Suitable for overnight sleeping or for naps during the day. Approved under the European Safety Standard for pushchairs and prams EN1888. Koos iSize is an enhanced “i-SIZE” child restraint system. It has been approved under Regulation ECE R129, for children with a height of between 40 -83 cm. Birth to 15 months approx. When used with the iPlatform base it is anchored to the car with isofix and a front anti-rotation leg for complete safety and reliability. This is the safest installation system, as it prevents any installation errors that could affect safety. Koos iSize is compatible with the European Regulations R44 and the new R129 (iSize). Means it can be installed with car seat belts (ECE R44/04) if the base isn't available. The PROFIX connection system makes it compatible with the new iPlatform ISOFIX base and all Jané PROFIX pushchairs and chassis. Side impact protectors that are specially designed to absorb side impacts along with the adjustable headrest. Fitted with "memory foam" for maximum dissipation of loads in the event of a side impact. Multifunctional button for easy carrying handle adjustment and travel system chassis release. Adjustable headrest to 5 positions while baby is in the seat. Straps adjust and adapt automatically when you adjust the headrest to your baby's height. Complete with adjustable hood to protect baby from the sun and wind and creates a cosy environment for rest and sleep. And finally, iSize means more peace of mind. Not all current child car seats fit all car models securely. However, all iSize car seats do fit all cars equipped with the ISOFIX system. New 40-60 cm cushion insert, for newborns, which improves the resting angle and increases safety in the event of side impact.